Some new grass (mid-picture) in front yard after I watered. I don’t have much clever or pithy to say on the “Innocence of Islam,” except to note that the Internet makes the spread of odd, jerky nonsense way too easy. And that violence against Americans is a sad knee-jerk reaction. Neither extreme in this dispute, as the world again seems a more violent and less tolerant place, seem to have much appeal to me. And we’ll be inevitably thinking about what the First Amendment means, so I guess this creates a new case study to talk about in my media courses. Frankly, I’d be much happier with the old case studies. The drought in Iowa is easing, just a bit. Rain is expected tomorrow. But with new grass sprouting, I can’t let the surface of some new grass areas of my lawn dry out. They say you should water every day when you have new grass, although I never have. But, it was Sunday when I watered last, and I meant to water Tuesday and ran out of time. Every other day is what I aim for. Tuesday’s watering was Wednesday morning, and Mother Nature should take care of things until this weekend. I was a bit distracted as I watered this morning. I usually enjoy being outside doing something that benefits growing things, but I had listened to NPR, and the day after the anniversary of 9/11, yet another tragedy had befallen my fellow Americans. It leaves me a bit angry and scared. It leaves me upset with the jerks in California who made this loathsome, stupid film. It also left me queasy, thinking that some attack on the First Amendment freedom of expression may be looming out there. And it left me a bit nervous about what comes next. How will we react? How will the rest of the world react? These are complex problems. Barack, hands down. As I water, one point in comfort that I have is that the person at the helm seems more experienced and steady than Hillary imagined four years ago (and yes, it helps that her fingers are in the mix, too). On foreign policy, Mitt doesn’t seem ready for prime time. Or so it seems to me, for now. I’m glad these delicate and big decisions don’t depend on me at this moment. I hope, and pray, that cooler heads on all sides will prevail, but I’m afraid of what will happen between then and now. In the meantime, I guess I will water. It seems all I can do at the moment. 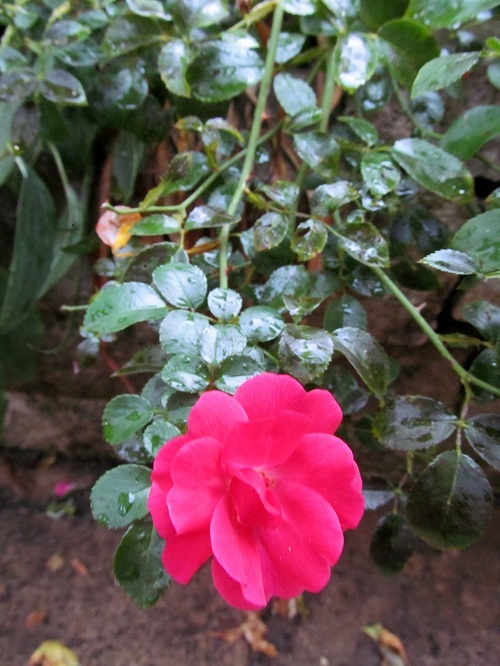 Rose in front garden, damp from morning watering. 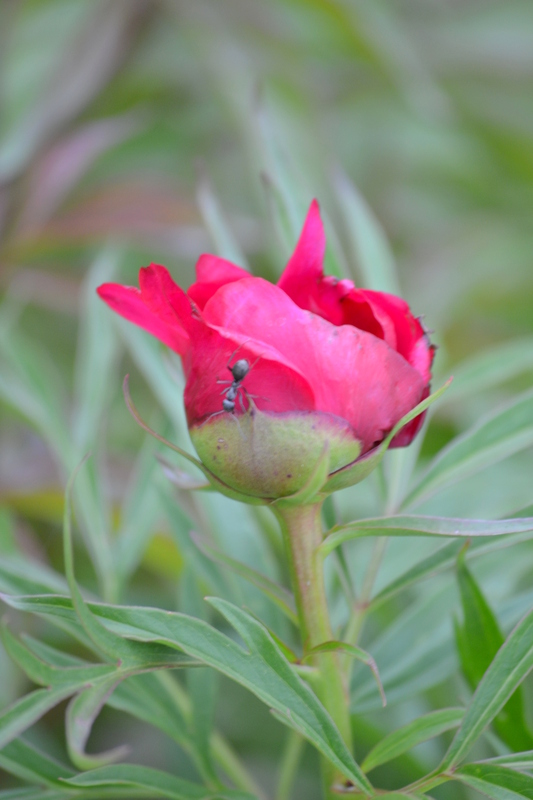 Ant on a just-blooming peony. These are the frilly, early ones, the "regular" peonies are still weeks away. It does feel odd to have peonies before May, though. I mowed and put in new solar lights on Saturday. Plus, I planted some grass seed. That doesn’t sound like much, but Saturday was mostly gone by the time I was done—barely time to quickly snap some flower photos before the day was spent. But, I had to snap those photos, because, ta-da! Peony day—the early peonies are opening. Sister, I know the feeling. So then, after a two-hour bike ride, I graded. And how I’m posting flower photos. Tomorrow looks like another long, dreary, grading Monday. Oh well, at least the peonies are starting to bloom! Early tulips and daffodils are finishing, but I have such a variety that they are still going strong. And the new lights are so strong they actually stayed lit all night, which is a bit bizarre for solar lights. Photo gallery of what I saw Saturday after I was done with my day of gardening. Hawthorn, front lawn, in field of clover (good) and dandelion (OK, but requires control) Hawthorne did not bloom, still too young, I guess, but I like its foliage nonetheless. Well, as far as lawn care goes, I try to be a centrist. I do not dump copious amounts of chemicals on my lot to eliminate any form of insect grub, non-grass plant or soil imbalance. I also do not “aerate” my lawn. Deliberately digging up dog-poop sized lawn divots is such a common process, perhaps it means something, but I can’t honestly wrap my mind around the concept of introducing oxygen into the soil to benefit plants—don’t plants consume carbon dioxide and fart out oxygen? Foot flowers. Nikayla's feet today. She and her family came over and we went for a run this afternoon--Audrey can keep up with my jogging pace while pushing Tristan in a walking stroller. Speedy? Not me. But, I make some attempts to care for it, too. I mow my lawn regularly (sometimes with a reel mower, which really upsets the boss because it doesn’t work well at all), I plant grass seed in bare spots and I do, now and then, no more than once a year and sometimes not that often, fertilize. I don’t belong to that fundamentalist theology. For one thing, I remember the old line that you can choose to raise grass or raise kids, but you can rarely do both—and I favor the kid end of that equation, which has become, in my life now, the grandchild end of the equation. The other extreme is the “I love dandelions” approach to lawn care. Mow your lawn enough to keep the city at bay, and otherwise learn to appreciate the beauty of whatever green thing happens to sprout on your lot. The renters on our other side seem to fall more into that camp. And my mother was an outspoken extoller of the beauty of dandelions. I don’t belong to that school of thought, either. For one thing, I do like the look of grass, and while I don’t want it as perfect as AstroTurf, I don’t want a crazy quilt of thistles and creeping Charlie, either. For another thing, there is the “nuisance” factor. While I do not care for the wall guy’s green carpet, if I allowed anything at all to grow unmolested on my land, the many weeds of my lot would constantly be encroaching on my neighbors. Exhibit A: Note the top of the photo. Creeping Charlie, despite its charms, is an inherently ugly plant and crowds out all others. This is a region on the west side of my lawn, adjacent to neighbors who do zero lawn care or weeding. CC constantly invades from their lot. I don't care enough to make it an issue with them--to each his own--but do attack creeping Charlie. Of course, some would say, so what? But I think that some of the invaders, particularly creeping Charlie, can be obnoxious, so letting those plants take over my lot would be a bit rude to neighbors. I guess the real crux of the matter is a plant sometimes called “ground ivy” or “creeping Jenny,” but has a more common name—how do you feel about creeping Charlie? My family member says it’s a fine plant, with pretty flowers and a nice aroma. It’s low and green and mow-able, and why not have a lawn of that fine flower? Well. Exhibit A—the photo. I will concede that creeping Charlie has pretty flowers. But the plant itself is not really green at all. It’s sort of a dirty looking purple green. The plant blooms briefly, and is otherwise a hideous lawn invader. An aggressive, tough, take over the world and overrun both your lawn and your gardens invader. 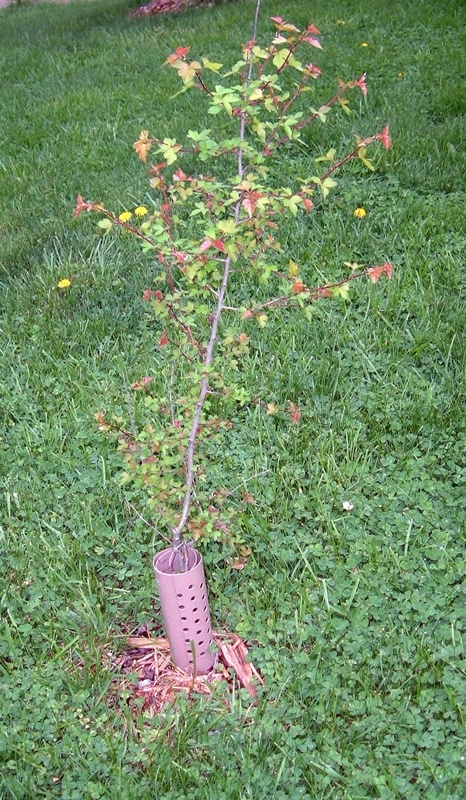 I wage an ongoing low-level campaign against creeping Charlie, using chemicals (but only directly on the plants, I don’t weed-N-feed my lot because I don’t want to endanger other non-grassy plants) and physical pulling. Clover and dandelions. I like them both, but do remove the dandelions--they just spread too much. Clover, in my opinion, is just interesting grass. 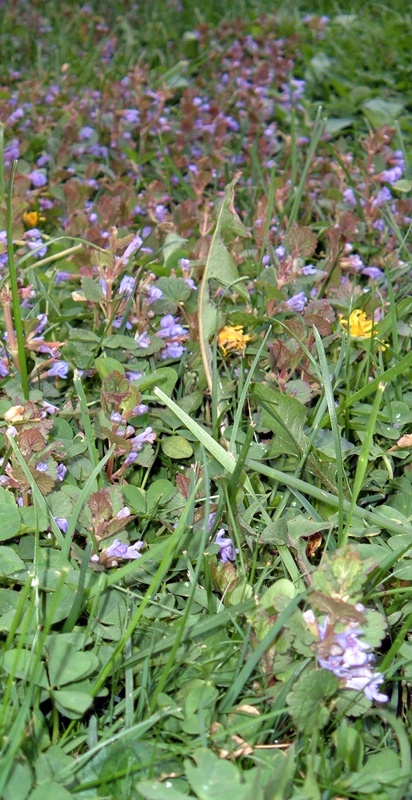 There is so much of it in my backyard that I have no hope of eliminating creeping Charlie. So I do my best to contain it. 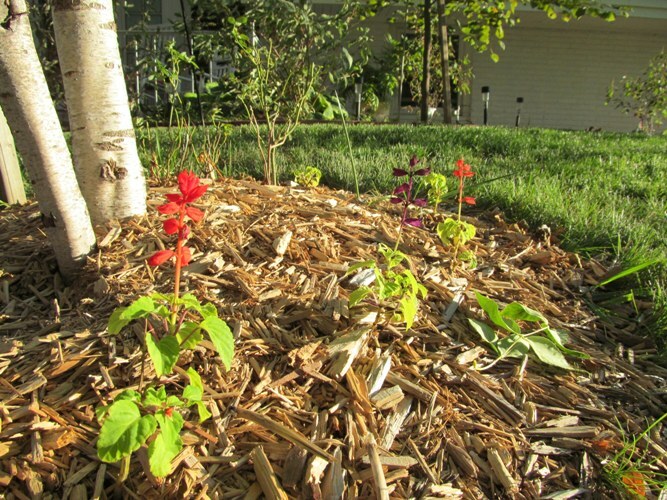 I am comfortable trying to keep it a little humble, under control, not taking over the whole yard and gardens, but not wasting my time always attacking it, either. Anyway, my attitude about other controversial lawn species? Clover. It’s the white angel to the red devil of creeping Charlie. Like CC, clover creeps and spreads and flowers. Unlike CC, it doesn’t usually form dense mats that crowd out all other grass. Also—again see photo—clover is the same color as grass. 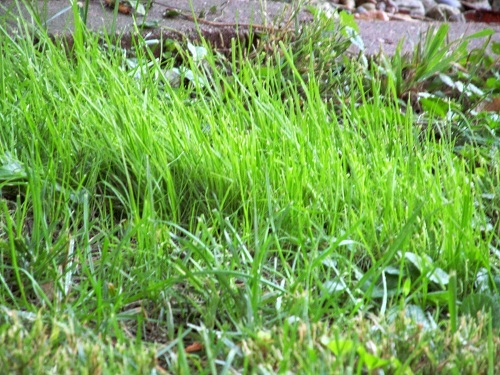 In many lawns it was accidentally or deliberately planted as grass. My attitude? I do nothing to discourage or interfere with clover. It’s just grass without the spikes. Sure, the flowers attract bees and bees sting—a painful reality of both my youth and adulthood—but come on. In 51 years on the planet, I have been stung maybe a total of four times. Not enough to change my generally favorable opinion of clover. Just wear shoes when clover is in flower. Native violets. Pretty in the garden, invasive in the lawn, I try to move some and shamelessly kill the others. Then again, I try to plant grass in my lawn and kill it in my garden, so violets aren’t the only plant whose location makes all the difference. I found a pretty white variety that is not as common as the purple type, and wish more would attempt to encroach in my lawn so I could move it to my gardens. Violets do spread, but seem a bit more relaxed than dandelions, so I encourage violets in my gardens. Front lawn. 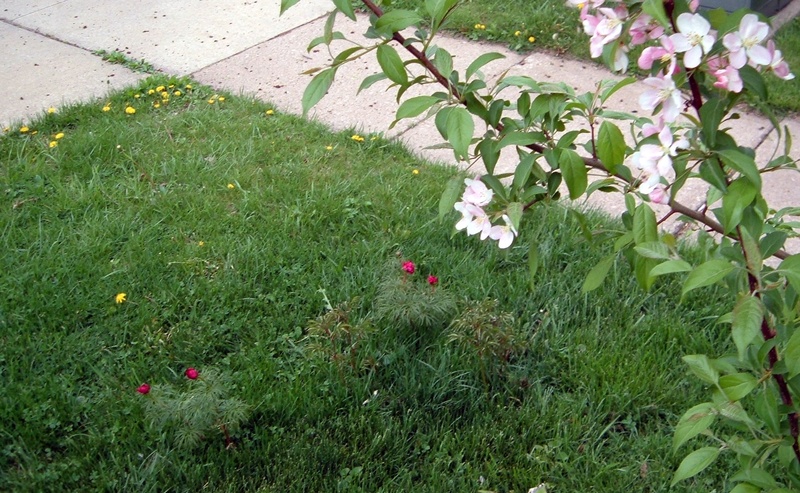 One crab apple in bloom (has a twin that did not bloom yet, but front lawn will be very nice when it kicks in, too). Note new peonies in background about ready to pop with pretty red flowers. The dandelions where drive meets sidewalk are the neighbor's--the peonies are near the property line. This is looking towards the rental lot. Wally would never allow dandelions on his outdoor carpet. In sum: I like a healthy lawn, but my standards of “health” are far lower than some. I want grass that can resist weeds, and I attack the weeds that are so aggressive grass stands no chance. 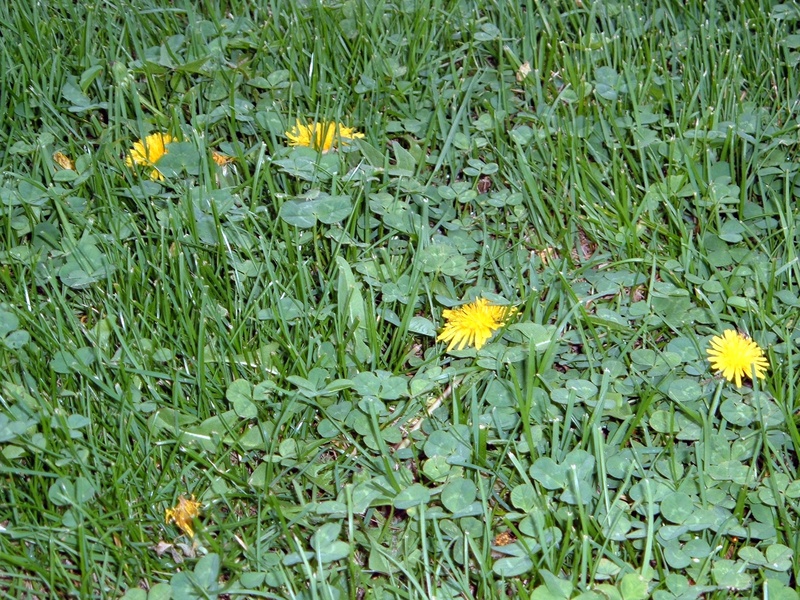 But I am not a “uniform turf” kind of guy—I like having a few dandelions and think of clover as “grass.” (I have not noted some obvious problematic plants—yes, I attack and destroy all thistles and garlic mustard. Goes without saying, I hope). Yeah, I know, this long blog post doesn’t even grapple with the central point—to fertilize or not. Again, I waffle. I don’t very often, but did this spring primarily due to new grass being planted, and partly because the fertilizer is also good for my gardens.